Struggling to retain you best call center agents? Follow these easy steps to create a successful representative –centric program. Measurement Performance: Set agent standards based on calls per day basis, calls per hour, a mixture of both, or something else entirely. Then tell your agents what that standard is. Train: Determine how well-versed your agents are in various financial topics. Identify weaknesses and help your agents improve. Cross-Sell: Gauge how effective agents are at identifying member needs and engaging in sales opportunities. Benchmark: Have agents track performance items such as loan applications generated, new member packets sent, and new services generated per member. Set goals and help agents identify where they are successful and where they need development. Incentivize. 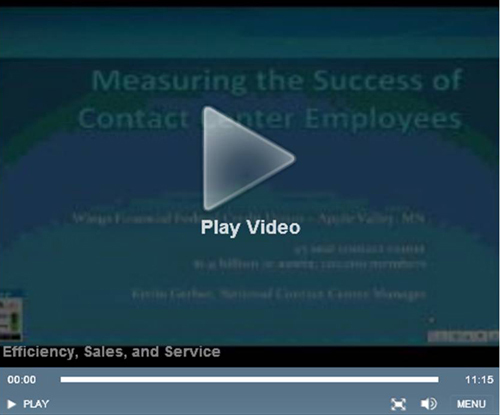 Give your call center agents the tools they need to succeed. Provide training, direction, and perks to help agents that want to succeed. Retaining good agents is more cost efficient than finding good replacements. Watch the clip above to learn more about Wings' strategy for retaining top call center employees. Access the full event: Call Centers: Balancing Quality, Productivity, and Cost and check out other Upcoming Live Events on CUtv!